What’s on Your Holiday Playlist” is a recurring feature where I ask one woman to create a holiday inspired soundtrack for us. This Rosh Hashanah, I asked Maya Ross to build a Rosh Hashanah mood for us. 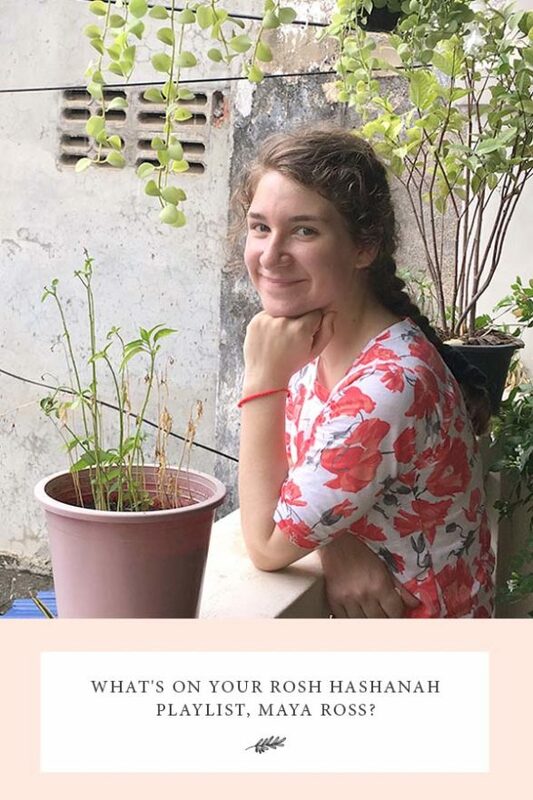 I met Maya in January 2018 when she came to Cambodia during her gap year. She volunteered as a Circus teacher at Phare Ponleu Selpak, a non-profit Cambodian association that improves the lives of children, and their families, through art schools, educational programs and social support. Having Maya living near our family in Cambodia felt like having a very intelligent, friendly and supportive younger sister living nearby, or how I imagine it might be since I have two brothers. She shared Shabbat meals with us, many meaningful conversations (and texts), walks, and laughs. Currently Maya is a full time student at East 15 Acting School in South End, England For the next three years she will be pursuing her BA in World Performance. Maya is passionate about the arts and during our time together we spoke about books, music, movies and theatre. She is the perfect woman to create an inspiring playlist for us this year for Rosh Hashanah. Let’s connect with Maya and listen to her. May this post inspire you. What mood are you building with this Rosh Hashanah 2018 playlist? Celebratory and rejoicing the new year! But also, an exploration of Jewish music around the world. The following songs are from Israel, Spain, Greece, and the United States. A combination of Sephardic and Ashkenazi songs. I imagine you listening to this playlist while preparing the Rosh Hashanah dinner, with the whole family singing along and helping for a celebratory dinner with friends. I also just imagine dancing in the living room! The first song is a Sefardi song which slowly brings us in the mood of the holidays. Its begins tranquil and gradually picks up a pace. This instrumental piece, played in renaissance style, is about the longing for what was lost in Spain after its diaspora. The legend tells that some Sephardic Jews retained – generation after generation – the keys of what was once their home: Sepharad. The album “Música Encerrada” is played by Capella de Ministrers and Carles Magraner, from Spain. El Nora is a song I first heard on Purim in the Synagogue in Geneva, Switzerland. I looked all over to find the same version on YouTube, but sadly couldn’t find it. This version is very uplifting and has a great instrumental section. El Nora Alila is a piyyut that begins the Ne’ilah service at the conclusion of Yom Kippur. This is a song of my childhood. My mother played this CD in the house and in the car. Though my family is not Greek, this is a Sephardic song from Rhodos, Greece. She loved it because it was a song about the ways to prepare aubergine. You just want to dance and sing along. This puts your mind at rest…Tansman was a Polish composer and virtuoso pianist of Jewish origin. He spent his early years in his native Poland, but lived in France for most of his life. He was friends with Charlie Chaplin, and played for the Emperor Hirohito of Japan and Mahatma Gandhi. You can hear the power of Jewish musical roots, and the Polish flavors. I am a Musical Theatre fanatic! So of course, we must include Yentl. And who isn’t a fan or Streisand?! I remember singing this Soundtrack infant of the piano with my mum accompanying me. I love this song. It brings so much warmth into my heart. Thank you Maya for inspiring us! Your turn: What song would you add to this playlist? Put your choice in the comment section below.